Managing layers requires careful attention to nutrition, the farm environment (ventilation, temperature, lighting), and the type of housing system. As your litter moves from the breeding stage to , the beginning of laying and the end of laying, the birds will have specific needs in their diet and environmental conditions. To ensure that egg production remains high and that birds are eating well, there are a number of resources available to help maintain good performance. Our technical service team is always available to help you with any management question or answer any questions you may have. The transition from a cage system to an alternative housing system, whether cage free or within an aviary system, requires careful attention to good management. One important aspect is nutrition. Prolonged laying cycles have become a global reality and an unstoppable trend. Selective breeding for persistence has certainly played an important role in achieving higher yields. Managing breeding flocks in high temperature climates is an even greater challenge than managing herds of the same genetics in temperate climates. Higher placement rates, better persistence and longer production cycles are observed over time (Fig. 1). 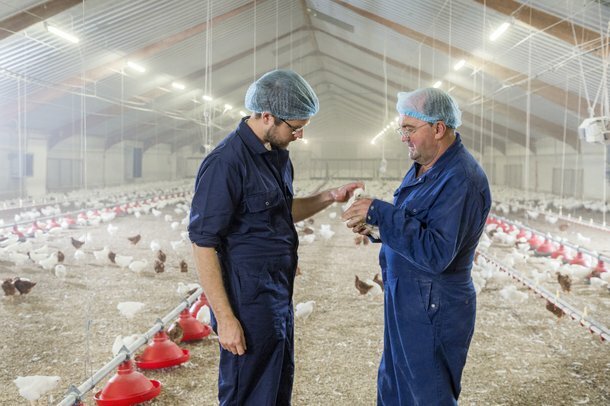 This trend will continue as breeding enterprises, egg producers and feed businesses collaborate with each other. In order to give your flock the best possible start, rearing conditions for newly placed chicks are very important.